Great Baby Stuff Blog: Boogie Wipes Review and Giveaway! Boogie Wipes Review and Giveaway! Somehow I was lucky enough to receive these Boogy Wipes to review just as my 10 month old son has come down with a cold (and probably ear infection again, poor guy) that has him running at the nose all day. He really hates when his nose is runny. I have to keep an eye out for any draining boogies, and especially if he sneezes, and quickly wipe it up or he will reach his little fist up there and do it himself, and well. Its certainly not bugging his nose and lip anymore after that, but it sure is everywhere else. I must confess that I have tried Boogie Wipes before, someone gave me a pack of the green Fresh Scent Boogie Wipes as a baby shower gift, but my son was too small to know the difference anyways then. At first I was skeptical because I figured, "Hey, these are pretty much just baby wipes with different smells, right? Cute to have but I can just open up my baby wipes just as easily." I found that this is not true, that they actually feel quite a bit different than baby wipes, for one thing they are not as wet and don't leave your face feeling like you need a towel. They also do not sting, and a baby wipe tends to sting if you have to wipe often. They are bigger, big enough to wipe baby's whole face and hands and arms if he or she has smeared boogies there. I liked them because I tried them out myself and found the feel and smell of them was a lot better than regular tissues. They felt as if they might help the soreness around my nose instead of make it worse. Boogie Wipes are made especially for wiping and soothing runny noses, and getting them nice and clean without causing redness and soreness after uses. They contain Aloe Vera, Vitamin E, and Chamomile, which is of course the quintessential combination of soothing ingredients. They claim to be hypoallergenic but they do also contain citric acid, so that could be a problem for babies who are sensitive to that. I believe it is used in place of alcohol, as I also use alcohol-free baby wipes that contain citric acid. I am not 100% sure on that, however. I would like to note that my son does have a reaction to eating citrus, and he has not had a problem with any wipes containing it including Booge Wipes. When I was sent the review package, I received samples of the Grape scent, Minty Menthol, and Fresh Scent wipes. They are also available unscented. I tried out each one on my son as he needed them, and was careful to note how he reacted to each. He really liked the Fresh Scent kind, and instead of putting a lot of effort into trying to get away from the wipe, as he did with the tissues and towels I had previously been using on him, he spent the time opening his mouth trying to eat the Boogie Wipe as I used it to wipe his nose. It was rather quite humorous and cute, and made wiping his nose loads easier! He also tried eating the Minty Menthol wipes, but he wasn't so patient with them. I really think they are a great idea though, as the scent of menthol helps clear out clogged up noses. If I had more of them, I would have liked to see if it helped unclog him a bit. The menthol is NOT too strong, and doesn't leave a sting on sore noses. Last I tried the Grape scented ones, and so far he hasn't tried eating them, but neither does he fight me to wipe his nose. He seems to like it as long as I don't glom all over his whole face, and just use the wipe to gently swipe it away. Luckily with the Boogie Wipes I don't need to wipe hard or scrub at his boogies, they come off very fast, easily and cleanly. All in all, using a Boogie Wipe means no struggling or sore noses for your little one. Especially for babies or kids with allergies, these are a great new product to have around to save our kid's noses. 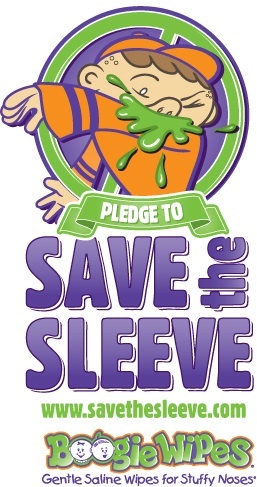 Speaking of saving, Boogie Wipes has a program called Save the Sleeve. Using a code on a boogie wipes package, your child can take the Save the Sleeve pledge and receive his own Boogie Wipes tat pack or backpack badge. You can also save upc codes to send in to get your child their own Boogie Buddy, an extremely cute Boogie superhero plushy. They also have a new line of Boogie Wipes for adults called Saline Soothers. You can check them out at www.salinesoothers.com. Boogie Wipes has also offered to give one loyal reader two packages of Boogie Wipes for free! You will get two of the four different scent choices. Here's how you can win yours! Be sure to leave a comment for each entry completed. Go to the Boogie Wipes website and check out their programs and promotions. Write a comment on one thing you found out on the site or one cool thing you can do on the site. "Hit two birds with one stone" and join the Boogie Bunch while you are there for an extra entry. Subscribe to Great Baby Stuff via email and confirm. Subscribe to the Boogie Bunch. They will also send anyone a coupon who does this. 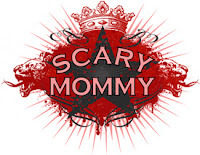 Like Great Baby Stuff on Facebook. Like Boogie Wipes on Facebook. Check out Organic Baby and click the Stumble button on the homepage to like it on stumble. Giveaway ends August 22nd. One entrant will win both Boogie Wipe packages. Open to US and Canada readers only. Winner will be notified via email, and will need to respond within 3 days or a new winner will be chosen. Good luck! I follow via GFC and learned that they're having a contest where you tell them why your child is "snot average"
Following GFC and learned at the boogie wipes website when you join the boogie bunch club you get a coupon! Subscribe to Great Baby Stuff via email. Like Great Baby Stuff on FB. Like Boogie Wipes on FB. I learned Boogie Wipes serve as an "all purpose" wipe, per se.